The Sennheiser SC 630 USB CTRL Corded Headset aka 'The Century' is Sennheiser's premium USB only ultra noise cancelling mono headset, designed to be used with your computer only - no further cables are required as this headset has a direct connect USB end. It is perfect for dictation programmes, webinars, video conferencing, listening to audio / video etc. If you have a modern phone with a USB connection for a headset port then you can use this with your phone but ONLY if the headset port is USB. The SC630 headset has an over the head wearing style, with rotatable microphone for left or right hand side wear. As with any corded headset, with the Sennheiser SC600s you are tethered to your computer via a cable, this can be frustrating when wires lie across your desk and get in the way of papers or drop down and get crushed & tangled under chair wheels. If staff sit close together or noise levels are high, Sennheiser SC 660 USB may be a better option as it is binaural and helps staff to focus in a busy / noisy environment. There are also padded headbands available in the CC 515 IP & CC 550 IP. If you don’t need the ultra cancelling microphone or every bell & whistle, the SC 230 & SC 260 are both excellent headsets. Another factor to consider is the extra productivity that can be gained from the freedom to walk away from your desk whilst using your headset. It is worth checking out the Jabra Pro 9450 which is a great entry level wireless option for only a small amount extra. If you want to stick with Sennheiser then the DW Pro 1 USB, is their magnificent wireless option, which also has an ultra noise cancelling microphone. 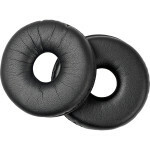 If you think 2 ears are better than one, the DW Pro 2 USB is your best choice. 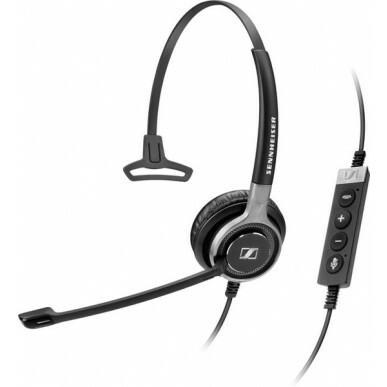 Sennheiser SC 630 USB CTRL is a premium single-sided USB headset for quality conscious contact center and office professionals requiring outstanding sound performance. Quality design Designed to manage calls seamlessly through the call control unit, SC 630 USB CTRL offers great functionality and convenience when connected to a softphone. Stainless steel and brushed aluminum parts with a unibody headband construction create an iconic, high-end design that enhances strength and robustness. User focus Features include sound-enhancement technology for voice clarity, with a leatherette ear-pad for powerful sound and wearing comfort. A metal reinforced headband maintains a perfect fit and is numbered for easy accurate adjustment. Incorporating ActiveGard® acoustic shock prevention, SC 630 USB CTRL is optimized for all-day users who require maximum call handling flexibility and durable highend performance in busy Unified Communications environments.